Eating healthy and losing weight are quite difficult goals in our fast-paced lifestyles. However, having an oil-free fryer on your kitchen counter may help you shed the pounds with almost no effort! Oil-free fryers make any food delicious and crispy without the added fat that was considered necessary in earlier times. 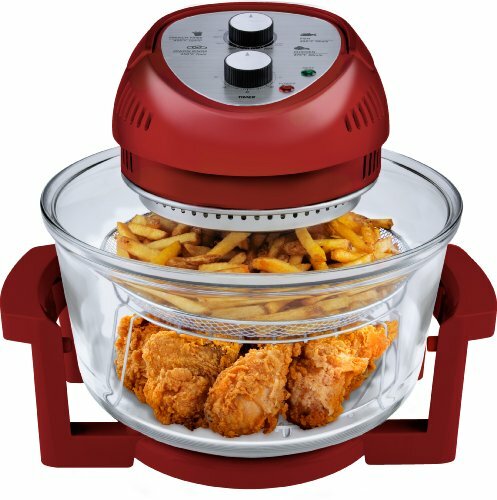 Now, it’s possible to enjoy your fries, crispy vegetables, and even crispy chicken with the right oil-free fryer. Not sure which oil-free fryer is the best buy? 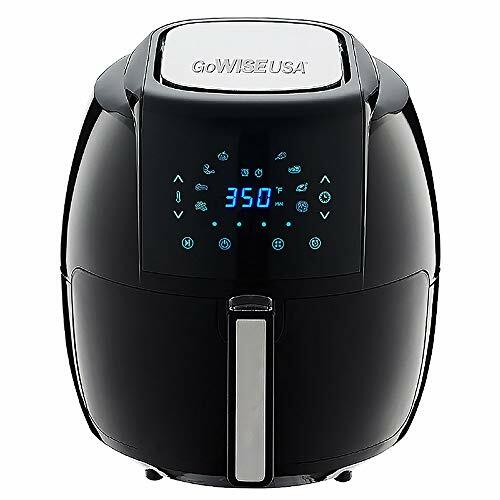 Below, we’ll guide you in choosing the best air fryer and also give some reviews of the best ones available today. Is an Oil-Less Fryer Right For Your Family? A large capacity bowl-style fryer, it uses three sources of heat to cook your food- a halogen bulb, an infrared element and convection heat. The glass bowl and lid allow you to see your food as it cooks. It comes complete with many extra accessories, including an extender ring and two stainless steel trays. The Big Boss has a large footprint, measuring 16 x 12.5 x 13.5 inches and weighs 14.74 pounds. The bowl has the capacity to hold 16 quarts. The unit has multiple parts, including the stand, glass bowl and glass lid containing the fan and halogen bulb. You have a variety of colors to choose from. A basket-style fryer with a medium capacity. It has a digital touchscreen with 8 built-in preset options and stay-cool exterior and detachable handle. The adjustable alarm can be set at 5, 10 and 15 minute increments. The basket and cooking pan is made with an environmentally safe PFOA-free non-stick coating. The GoWISE 5.8 measures 13.5 x 12.5 x 11.5 inches and weighs 16.5 pounds. The basket holds 5.8 quarts. The exterior is a single unit, is attractive and easy-to-clean. It also comes in several colors. A basket-style fryer with a smaller capacity, it has a digital touchscreen that is easy to use and adjust. The “starfish” fan design and rapid air technology cooks your food faster and with less shaking needed for even browning. The basket and detachable pan are coated with a non-stick layer, so your food will slide off easily. The Phillips measures 16.6 x 12.4 x 11.9 inches and weighs a hefty 18.98 pounds. The basket holds 3.5 quarts. The unit is modern and attractive, and the black exterior is easy to wipe clean. An oil-free fryer is a device that has gained a lot of popularity in cooking circles these days—and with good reason. This is an appliance that’s small enough to be used in personal kitchens for couples or tiny families. It’s basically used to fry foods using mostly the force of hot air. Hence, it’s a healthy substitute to deep fryers, using 75% fewer fat content without short-changing any of the flavor. Oil-free fryers are able to cook anything as a deep fryer can, with very little or no oil. The resulting texture is usual crispy or whichever way you’d like them to be. People have been cooking, baking, and frying in them for quite a few years now, with excellent results. There are several excellent options for air fryers on the market today. Read on to find out how to pick the ones most suitable for your needs, and check our air fryer reviews for a few of the very best. If you’re considering a greaseless fryer, you’re probably curious to find out how it all works. They’re a relatively new release, so many people aren’t really aware of how to cook properly in them and get the right taste. The first factor to understand is that oil-free fryers don’t really omit the use of all and any oil. For best results, you may have to pour or spray in little oil for certain foods. However, the reduction of oil is around 75%-80%, which is quite a huge change. For the best French fries, for instance, you may have to use just half a tablespoon instead of plunging them into a huge amount of boiling oil. The working of the oil-less fryer is concentrated mainly on circulating very hot air inside the appliance. This would evenly cook the food from all sides and make it crispy. The temperatures inside are high, around 200 Celsius (392 Fahrenheit) and the device is usually made small in order to ensure even distribution. With the hot air circulating, even that tiny bit of oil would vaporize and seep into all the food, utilizing its full cooking potential. The air is thus humid with oil instead of water. This is called the Maillard effect, which results in food having a crispy and browned texture. There are several settings on most air fryers which allow you to cook different kinds of dishes without worrying about supervision. There’s a cooking basket where you can put in your ingredients, and a cooking piece at the very bottom to make sure the food isn’t overdone or undercooked. There are several different kinds of air fryers, and they come in sizes suitable for every family. We are going to focus on the two most common designs and talk about how they achieve their results. 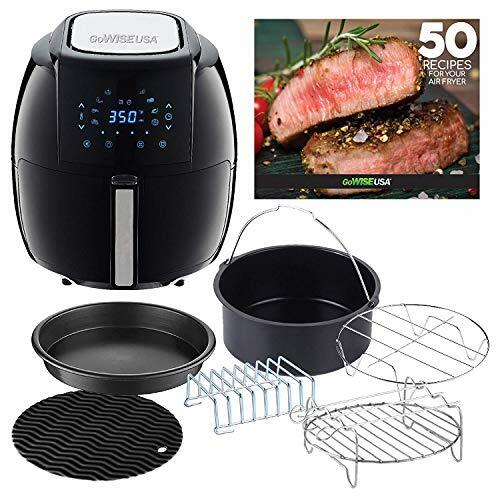 These seem to be the most popular style of air fryer on the market right now. They are easy to use and store, and are generally designed to look nice sitting on your kitchen counter. Basket-style fryers are a single unit about the size of a large coffee maker. There is usually a control panel on the front and a front-loading pull-out basket where you place your food. These units have a heating element and fans that push the hot air up and through your food, cooking it quickly. The housing contains the heat and prevents you from being burned while it is in use. Basket size is limited — you can’t cook something if it doesn’t fit in the basket. 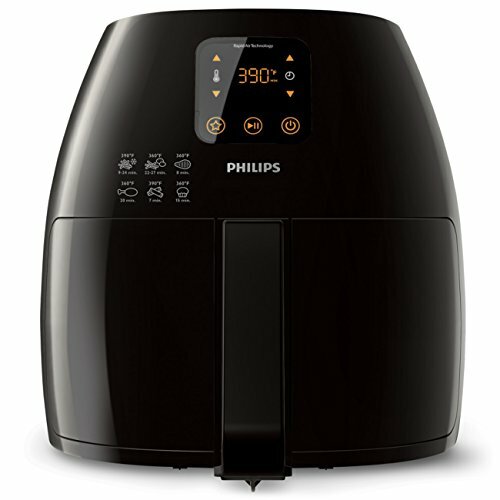 This style of air fryer uses a halogen bulb as the heat source, along with other heating elements and fans to circulate the hot air. The control panel and fans are built into the lid containing the halogen bulb. You place your food in the bowl on the stand, and then place the lid on top of the bowl to start cooking. The bowl-style oil-less fryer has a larger and more flexible capacity than the basket-style units. Many come with extender rings that allow you to cook larger items, like a whole chicken or roast. Flexible design allows more cooking options. They have a larger capacity than the basket-style. Larger footprint and harder to store than the basket-style. The parts of the unit will get very hot while in use and could cause burns if touched. They have a steeper learning curve than the basket-style units. Oil-free or greaseless fryers may be getting more common, but that doesn’t mean all of them offer similar features. You should hence know just how an electric fryer without oil can benefit you. This is the first and most obvious advantage of greaseless fryers. We don’t have to drown our food in fatty oils or butter in order to make it crispy and delicious. This is a huge upside since the fryer that uses little oil makes healthy eating much easier than before. With oil-less cooker, you can enjoy food much more quickly than with the stove, oven, or grill. After a long day at work, who wouldn’t love the option of having perfectly cooked, crisp food in a matter of minutes and without an oily mess? This will also save your family from the unhealthy habit of eating out or getting takeaways most nights when you just don’t have the strength or patience to cook manually. Reducing our fat intake is recommended by many health experts, especially for those of us who have weight, cholesterol, or heart issues. Hence, this is the perfect choice for those who want to lead a healthier lifestyle and have the food to support it. Small kitchens are the norm in apartments, and this device wouldn’t take up much of your counter or cabinet space. Air fryers don’t just fry. They’re also great for baking cakes, roasting, and even making specific items like beef jerky. This little appliance can replace your oven, microwave, and fryer in one go. Even novice cooks can easily operate an air fryer if they have an instruction booklet and some recipes on hand. The electric fryer without oil is surprisingly simple and accommodating for the most rushed and inexperienced of cooks. There’s no leftover oil to clean up or strain; no huge pans to scrub; only a little pot to wash out. These greaseless devices are not dangerous like hot plates. They don’t pose a fire hazard and use much less electricity than most expect. Carbon emissions are minimized with the use of oil-less fryers, which also use less electricity than a conventional oven. Yes! Now you know why air fryers are the must-have appliance of the year! They are perfect for cooking in the summer, and for preparing light, healthy meals. An oil-free fryer has a place in every household, and gives you the flexibility you need to get dinner on the table in a snap with little extra mess!